Few things in the work place can be more frustrating and time consuming than keeping payroll. Unfortunately, it’s a necessary evil, as making sure your employees are fully compensated for their efforts is one of the key components of keeping the work environment happy. Fortunately, the time card template from Microsoft can take a lot of the stress out of dealing with payroll issues. The Microsoft time card template is a straightforward Excel template that will save you both precious time and money. After instantly downloading, the template is available to use immediately. All the previous stress associated with keeping payroll can be vanquished in a few clicks thanks to the Microsoft time card template. Download it for free today! Upon opening the Microsoft time card template, you will immediately notice there is space at the top of the document for both the manager and employee to enter their name. The employee will also enter their home address, email address and phone number. The next step in filling out the Microsoft time card template is to enter in the date of the last day of the time work period. This date will be placed in the designated space titled “Week Ending”. Perhaps the best thing about the Microsoft time card template is it also serves as a calculator. The template will automatically tabulate the weekly hours for an employee after they are entered. Once calculated, they will be displayed in the “Total Hours” space. Beneath this is where you will add the rate per hour for each employee. Once finished, the total pay will be revealed in the final box of the time card. After all pertinent information has been added, the final step in filling out the Microsoft time card template is to add the signature of both the manager and employee to ensure there are no issues with the week’s pay. After dating the document, it’s ready for saving on your computer or filing in your office. Download the Microsoft Time Card Template for Free Today! Every office strives to operate with more efficiency and a payroll office is no exception. Keep clutter out of your payroll office with the incredibly efficient and easy-to-use time card template. 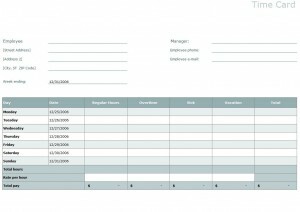 Download the Microsoft time card template from MyExcelTemplates.com today!